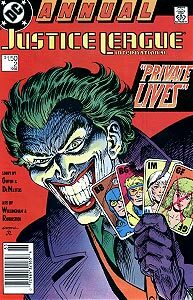 Cover Description: The Joker holds four damaged cards: a card with bullet holes depicting Blue Beetle, a card that has been burned depicting Booster Gold, a card that has been ripped depicting Ice Maiden, and a card that has been crossed through with ink depicting Green Flame. Brief Synopsis: Bialyan dictator Rumaan Harjavti hires the Joker to kill the JLI in exchange for assistance in finding Batman's secret identity. Issue Notes: The events in this issue cause a continuity problem, as they cannot logically occur at any point in the timeline provided by the issues of Justice League International. This story must take place after Green Flame and Ice Maiden II have joined the Justice League (Justice League International #14) and before the ascension of the Queen Bee in Bialya (Justice League International #16). Since Mister Miracle is in the story, it must take place before he is abducted by the Cluster at the conclusion to Justice League International #15. The most probable of an impossible flow of events places this story in between Justice League International #14 and #15, during the 8-hour countdown before the Cluster destroys the world. Among the many things that makes this story difficult to place in proper chronological context are small changes to continuity, such as the narration box on the first panel which claims that Maxwell Lord's Innovative Concepts Building is in New York City. Until this point, Maxwell Lord's headquarters has been in Washington, D.C.
Catherine Cobert forgives Booster for the incident in Paris during their first meeting in Justice League International #8. Booster admits to Beetle that she scares him. Booster and Beetle discuss their financial situations: they are both nearly penniless. Booster's company and fortune were stolen from him by the Manhunters in Booster Gold, Vol. 1, #23. Beetle gave his company and his wealth to his father in Blue Beetle #24. 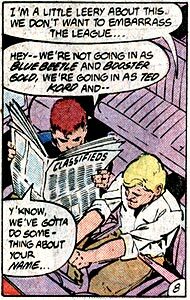 Now both live in JLI embassies and live off JLI paychecks. Booster and Beetle hatch their first paying scheme: become super-powered repo-men for a repossession firm for a percentage of the collection fee. Booster is leery of sullying the Justice League's name with their plans. This is a sentiment born of his respect for the Justice League, a sentiment that will soon pass. Booster and Beetle approach Repo Man, Inc. with their idea. Repo Man was the name of a 1984 comedy movie featuring young actor Emilio Estevez which soon earned something of a cult following. Booster and Beetle find the missing S.T.A.R. Labs combat unit amid several wooden crates marked "Power Dog Pet Food," in a warehouse owned by the 1000, the same criminal organization that he spent his earliest days as a crime fighter opposing. "Power Dog" is suspiciously similar to "Mighty Dog," a brand of dog food manufactured by Nestle Purina PetCare (formerly Carnation) since 1973. HIS STORY: While repossessing the combat unit, Booster tells Beetle that he is an atheist. It is unclear whether this is honesty or offhand levity. ...where it is stolen by the Joker. This pattern of Beetle and Booster successfully completing a difficult job for cash only to have it fall apart on them will be a recurring theme in future issues. By the way, this is the first published meeting between the Joker and Booster Gold (though the two will later come face-to-face in Booster Gold, Vol. 2, #5 which takes place during the events of Batman: The Killing Joke, which was also published this month). Boosterrific Review: It should be a crime for assassination attempts engineered by a homicidal psychopath to be this entertaining. Read and enjoy.